Molex released the stAK50h Unsealed Connection System, designed to deliver both signal and Ethernet connectivity in automotive body electronics, safety and driver assist, comfort and infotainment devices and modules. The USCAR-2-compliant stAK50h Connection System expedites validation time for Tier One automotive manufacturers making design changes and launching new vehicle models. The stackable header design eliminates costly custom tooling, engineering and validation time typically required in multi-bay automotive device and module configurations. 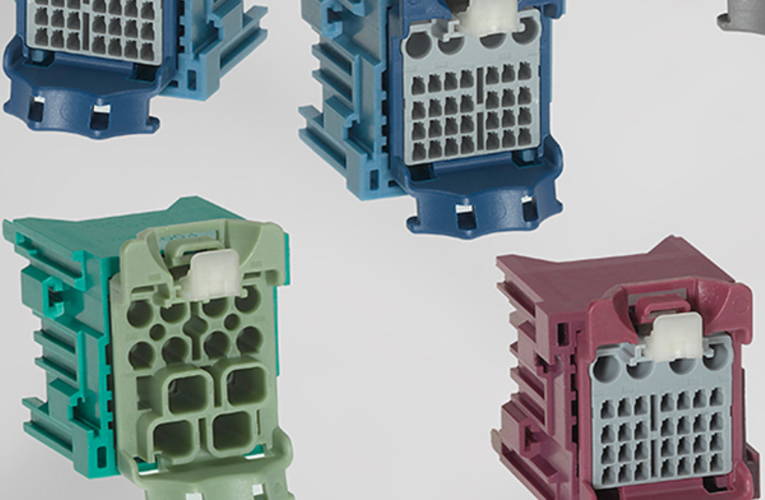 Incorporating through-hole style unsealed headers and hybrid connectors, the single- to multi-bay stAK50h Connector System meets industry-standard footprints based on 0.50mm, 1.20mm and 2.80mm terminal sizes widely used in automotive applications. The hybrid system is available with 12- to 56-circuit receptacles and can be used in applications ranging from low-current signal (5.0A) to high-power applications (30.0A). In automotive design, overly complex terminal designs and connector interfaces within a vehicle can lead to mis-mating and faulty connections. The stAK50h Unsealed Connection System headers and receptacles are color-matched to enable quick identification and easy assembly. The Connector Position Assurance (CPA) latching feature prevents accidental disengagement of the stAK50h connection system.